Flying higher? 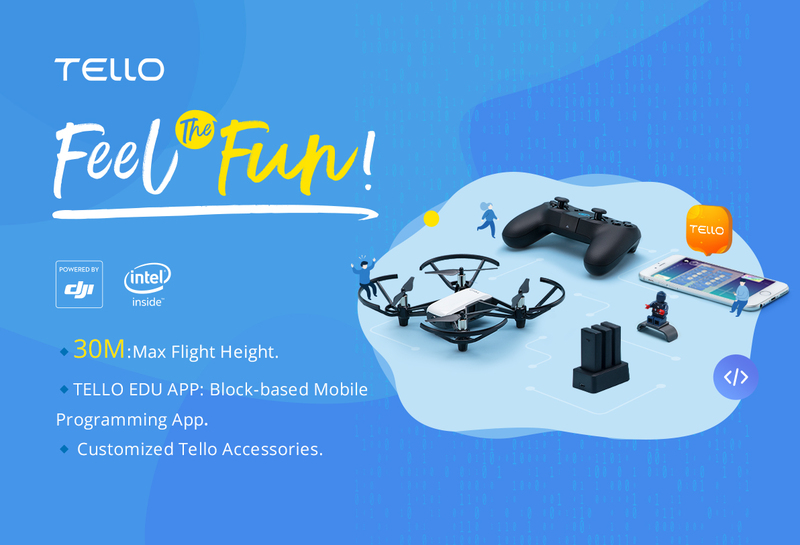 Now you can fly Tello all the way up to 30m, an upgrade from the original maximum flying height of 10m. Flying longer? You may simply own a battery charger hub to extend your flight time. On top of that, you can unlock more fun with various accessories such as remote controllers, stickers, colorful shells, as well as built-in ports to mount your favorite cartoon figures. I saw the Tello Edu app mentioned on the poster and looked for it in the Google Play store. The developer is listed as Wiedu. Is this the correct app? Got a tello for times when it is windy and wet outside. For the price the tello is an outstanding little drone, great quality and more importantly flies fantastic, stable a fantastic trainer. If you haven&apos;t already got one, treat yourself, it&apos;s money well spent. Got a free Tello with my quad purchase. Now I&apos;ll need to start buying more batteries? Well I will if I don&apos;t want to wait 1.5hrs between flights. oh boy. That&apos;s really a good idea Vlas. However, we pretty sorry that there is no built-in GPS to locate its position as well as track, that accounts for the available for tracking. Whats more new about it beside it can fly 30m way up? The first Tello has distance issues, has this new Tello improved it&apos;s performance? Cool. Do you ship worldwide? Is the update to 30m a firmware update or a hardware one? Firmware upgrade Quade. 30m Height would be available after upgrading to the latest firmware version. My Tello indicates the latest firmware...1.04.35.01 but the altitude is still limited to 10m. My sincere apology for the late response, Quade. In the same page with firmware version & APP version，please scroll down to the bottom to find the max height adjustment and set the Max height as 30m, which you might have already known it. Once again, sorry for the late reply.